At MAC Containers, security and safety are our highest priorities. If you have hazardous substances such as chemicals (e.g. acids and alkalis), products containing chemicals (e.g. pesticides ) or flammable materials they must be stored in compliance with COSHH (Control of Substances Hazardous to Health) regulations to prevent exposure or reduce exposure to those substances. Our steel COSHH store containers are designed to meet COSHH guidelines for the storage and control of hazardous substances and will give you the safest HAZMAT storage environment vital to protect employees and members of the public. The COSSH Store is a welded steel box structure manufactured for the static storage of up to 10 tonnes (for the COSSH Store 20') supported on its base. Our COSHH store base frame is manufactured from 76mm x 38mm rolled steel channel cross-bearers at 405mm centres welded to 102mm x 51mm side member channels. Bearers overlaid with 3mm steel flooring. Steel specification to BS 4360:43:A. Tensile quality. 2 No. mild steel trayed double doors, hinged with 3 no. internally mounted hinges per door of a unique design (UK Patent No. 2245017), which renders them resistant to exterior attack. These comprise stainless steel hinge pins mounted in nylon bushes, providing a maintenance free operation. Retainer to each door. Door sill of 100mm x 50mm. Anti-Vandal Internal Locking Mechanism - The left hand door is secured by the over-lapping right hand door. The right hand door is then locked into place by an internally mounted rotating bar and cam arrangement. Three claw plates, which are fitted to the rotating bar, clamp the left hand door. The handle that operates the rotating bar is set into a steel box, surrounded by anti-jemmy angle and 3mm steel reinforced lid, which slides to the left before locking with a 5-lever insurance approved mortice deadlock. Facility to secure handle with client's own padlock. Corner Pillars Manufactured from 3mm pressed steel sections welded to top lift plates. Steel specification to BS 4360:43:A. Tensile quality. Constructed from 1.6mm deeply profiled, mild steel welded at joints and corner pillars. Steel specification to BS 1449:1983:Part 1:HR 4. All steelwork sprayed externally and internally to an average film thickness of 75 microns (external), 40 microns (internal) with a one coat hi-build anti-corrosive, self-priming modified alkyd. NB. Colour of interior may vary from exterior finish. A range of optional extras are available. COSSH Store sizes are available from 8' x 8' up to and including 40' x 12'. Maintenance The COSSH Store range of storage units have been designed and engineered to provide low maintenance and robust secure storage. Externally, the paintwork requires only occasional washing down. In accordance with company policy of continuous product development and improvement, we reserve the right to amend the design and specification without prior notice. All MAC units can be finished in a range of over 180 colours. 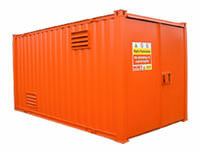 As a bespoke unit you will appreciate these hazardous material storage units are not available for hire, only for outright purchase.